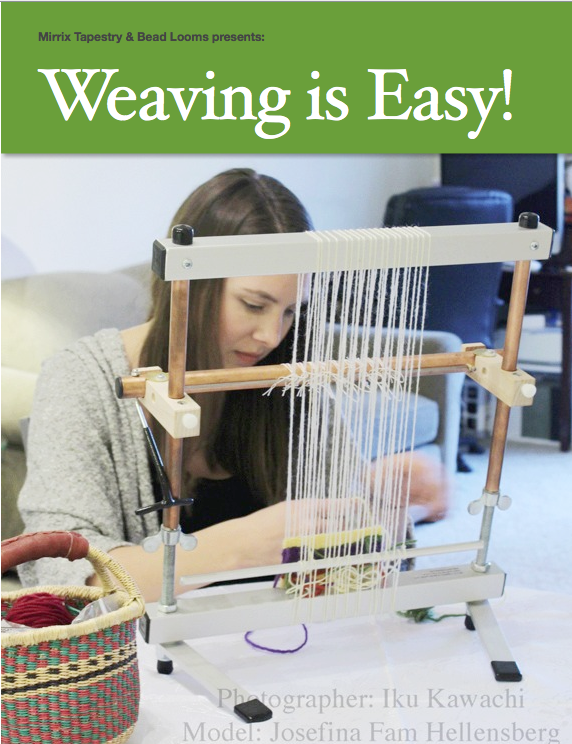 Because the weave-along is going over many different basic things (loom set up, warping, how to weave different ways), we suggest you just have some basic materials depending on what you’re interested in. 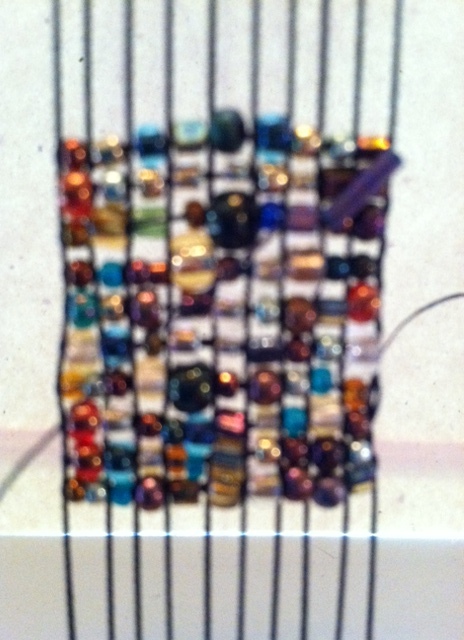 For bead weaving you will want a bead mat, beading needles, beading thread (we love C-Lon), and some beads. If you’re just starting out, 8/0 beads are great! You may also want to start with one of our kits and warp for that. 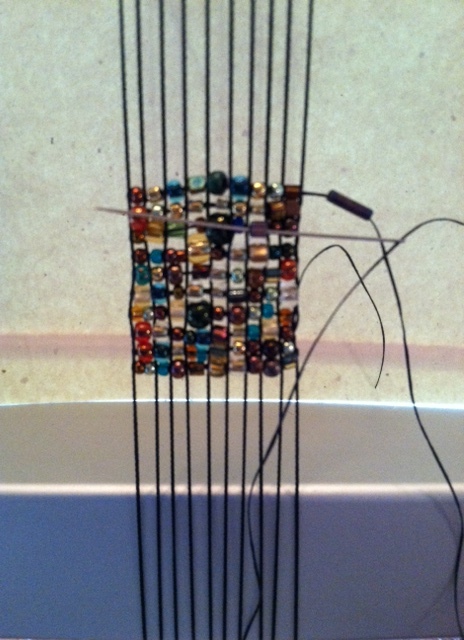 If you want to weave for bead weaving with the shedding device, you’ll want heddles as well. 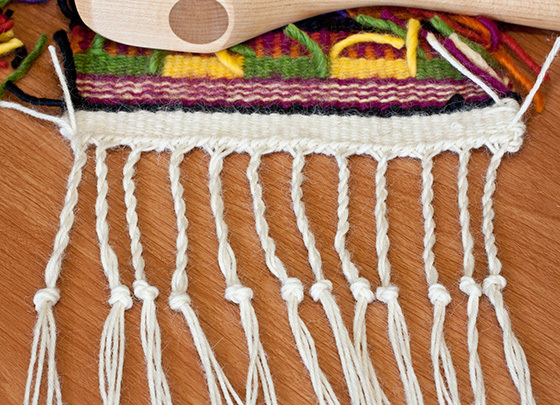 For tapestry you will want warp (we like Navajo wool warp), weft (some type of tapestry wool), a tapestry beater (or fork) and heddles. You can find all of these supplies on our website and most of it at your local bead or fiber store! 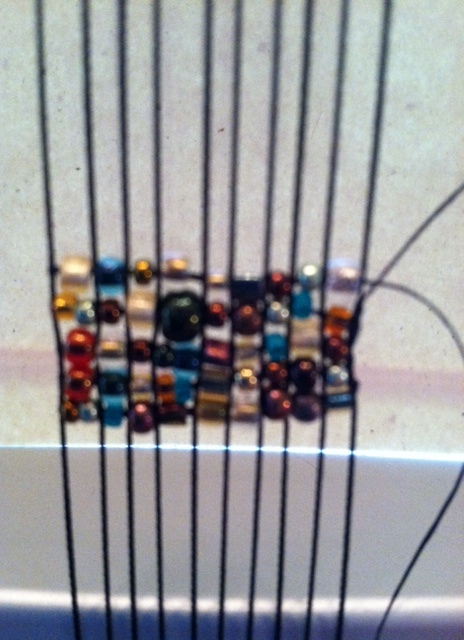 Bead Woven & Embroidery Bracelet: Finishing! 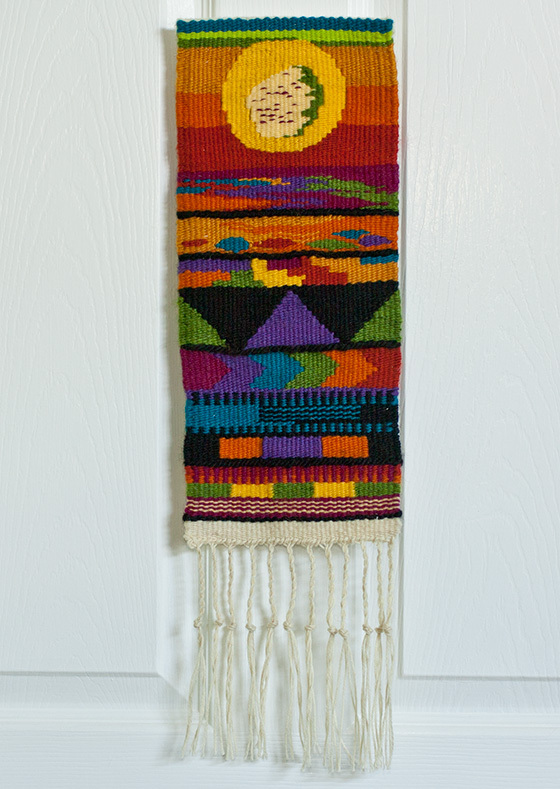 When you are happy with all of your weaving and the final look of your piece, it is time to remove it from the loom. Do not forget to measure it to ensure that it will fit the wrist of its recipient. In my case, it measured a bit beyond 6.25”. 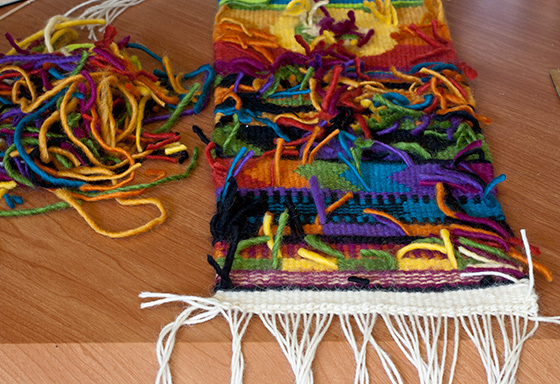 To remove the piece, loosen the tension on the loom and slide out the warping bar. Trim the ends of the warp threads so there are no loops. Tie overhand knots using pairs of neighboring warp threads. 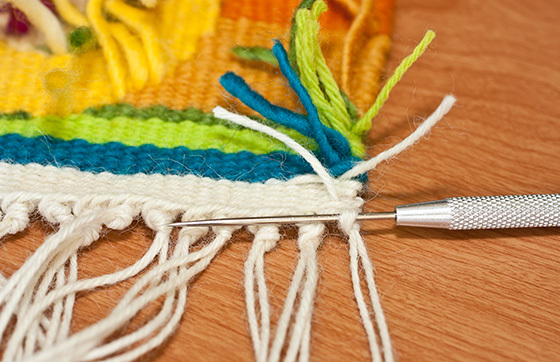 Be careful to get those knots as close as possible to your weaving. I measure and cut the ultra-suede so that it is the same size as my finished piece. Placing the finished weaving bead side down with the backside facing up, I dab a LITTLE BIT of trusty E6000 across the back of the piece being SUPER CAREFUL not to overdo it and have any glue- God forbid- seep through to the front of the piece. I use a small paint brush for this to better control the amount of glue. In this way, I am also able to glue down those pesky errant warp tail that want to stick out anyway. I am also careful to neatly extend the glue JUST to the edge of the piece so that the ultrasuede is sealed all around creating a seamless look without any messy glue seeping out. This careful glueing takes a little practice but can definitely be successfully accomplished. Of course I realize that many of you purists out there might never consider using glue at all but I can assure you that it does work and might even be preferable to those sometimes imperfect tiny sewing stitches around the edge. 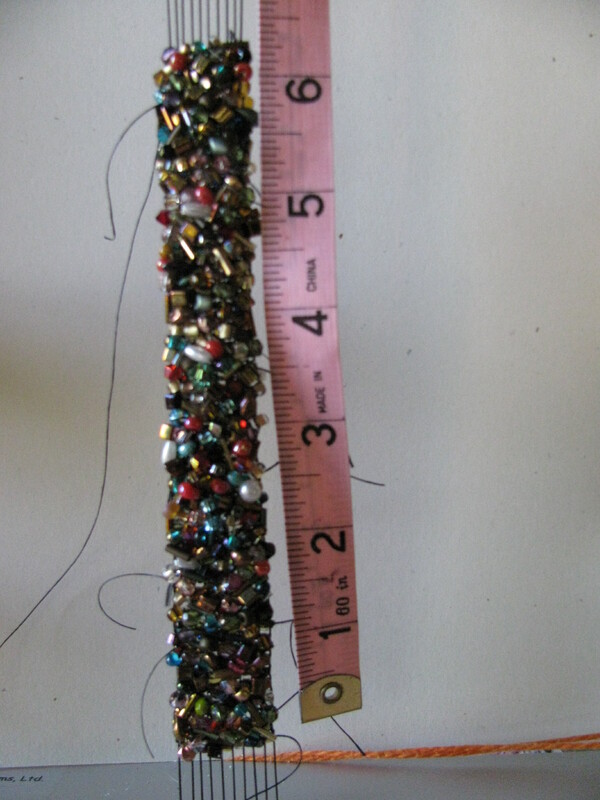 I should also note that in the case of this particular bracelet, I prefer not beading around the edge either as I believe that it detracts a from the finished beaded look of the piece. (Just my humble opinion here.) Feel free of course to choose your own personal finishing method. “Warp the bracelet around your wrist. Measure the distance between the two edges. This distance will be filled with the loop that the button will go into and the button itself. This cuff should fit snugly around your wrist. 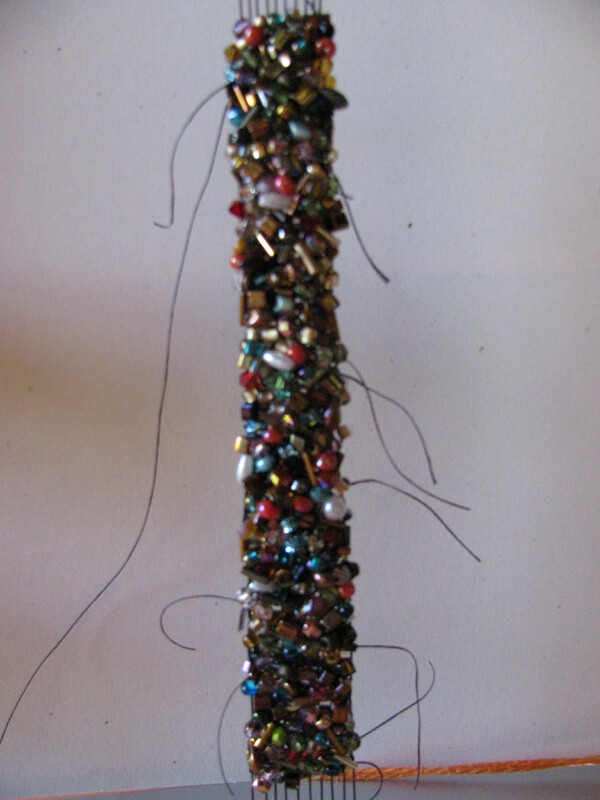 In any case, you will want to add some beads to the beading thread to attach the button. 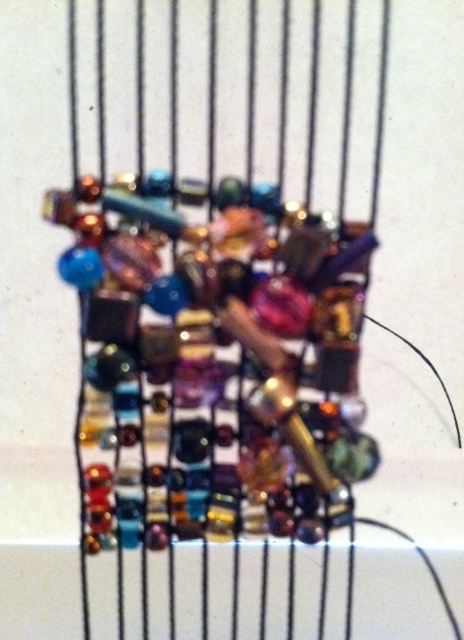 Center your beading thread at one end of the cuff in order to attach the button. WEAR PROUDLY AND WITH PANACHE! You can approach the weaving of this bracelet in one of two ways: You can bead weave the entire bracelet’s base and then completely embellish the full piece or you can weave the base for several rows, embellish just these rows, go back to weaving the base and embellishing those rows, etc. For these photos I did it the second way, initially weaving ten rows before embellishing. 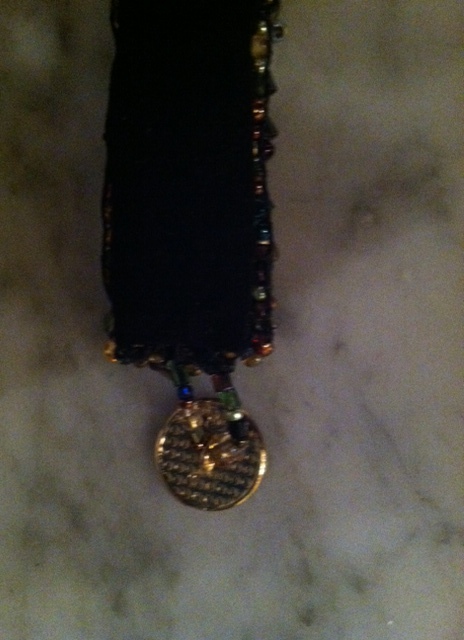 I was not patient enough to weave the whole bracelet before indulging in the fun part which for me is the embellishment. That is where you really get to play. It is best to do your embellishing when you are relaxed and not in a hurry. I must warn you that this is a very time consuming process. Each and every embellishment bead is threaded and secured individually and forcing a bead where it does not belong will only bring misery. Trust me on this- ask me how I know. 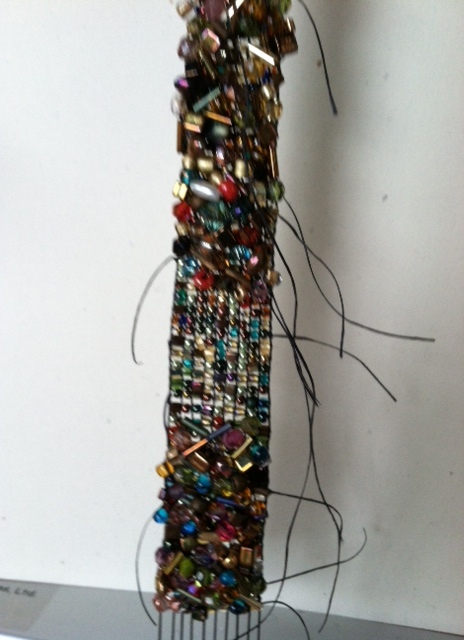 When you are ready to begin adding your embellishment beads, you begin by coming out the side of the last row you wove and picking up a larger bead. In my case I used a bugle bead on the top right hand side of the photo. 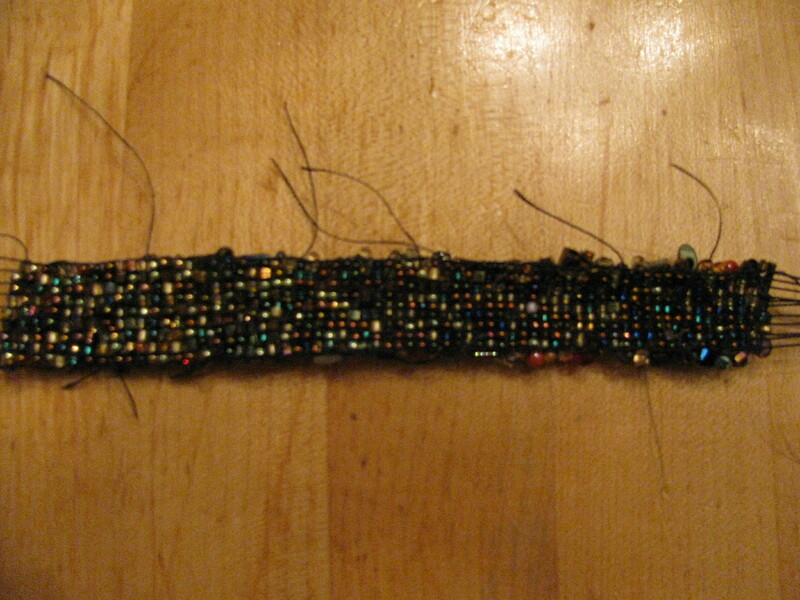 I then sewed through the bead below that is two warps over. According to the instructions the rule here is to sew through a bead that is far enough away that the embellishment bead will lie flat but not so far away that the beading thread will show. Although you will initially measure each bead before finding its landing spot, with a little experience after a few rows, you will pretty much be able to eyeball it and this will make things move along a little faster. 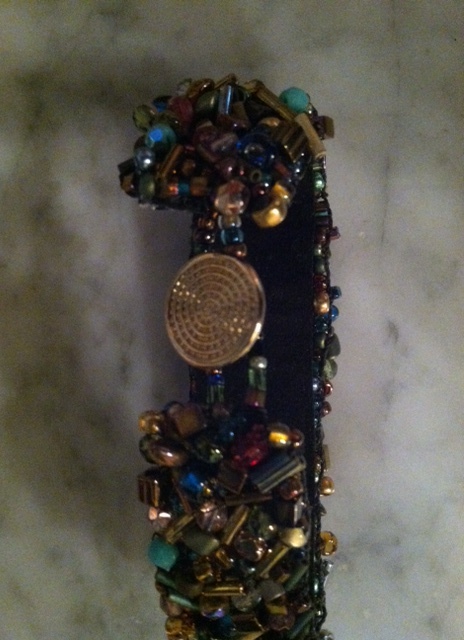 After placing the first embellished bead you can go anywhere you want in the woven piece. 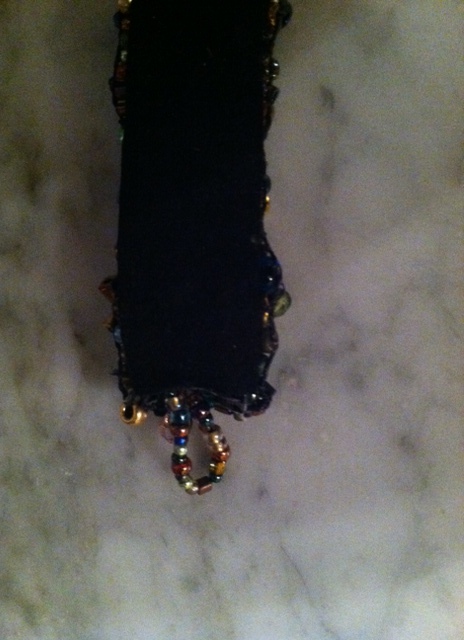 In my case, the next bead I added was a crystal traveling across the piece. You can choose to travel anywhere you like across the piece however you will probably find that working in small sections makes the most sense rather than criss-crossing all over the place and getting the embellishment threads tangled up. The point is to cover a lot of the base beads nearly entirely while angling the beads differently so that they add interest. You will continue weaving and embellishing until your piece is large enough to fit around your wrist keeping in mind the type of clasp that you intend to use. In the case of this kit, we will be making a loop on one side with a button on the other. Your piece will shrink at least a third of an inch when you take it off the loom because the warp threads are under tension so keep this in mind while measuring. 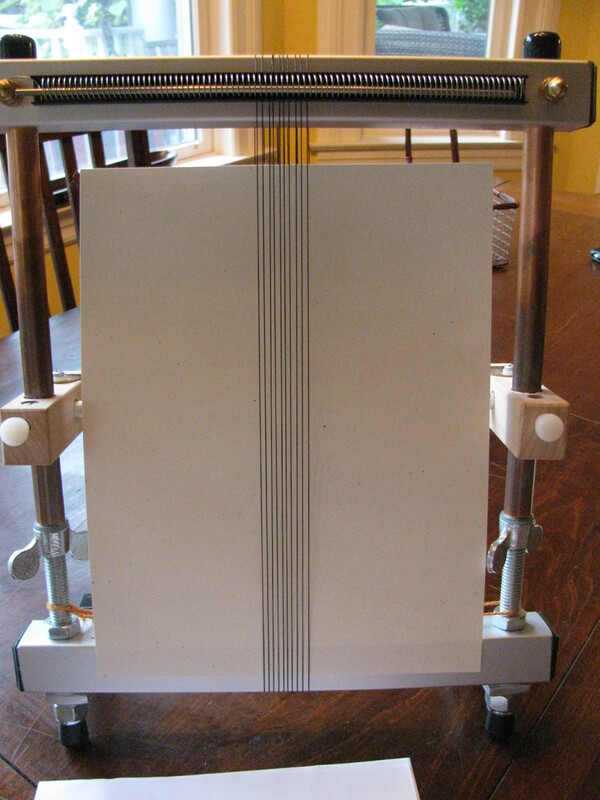 Check out our American Made profile on marthastewart.com! 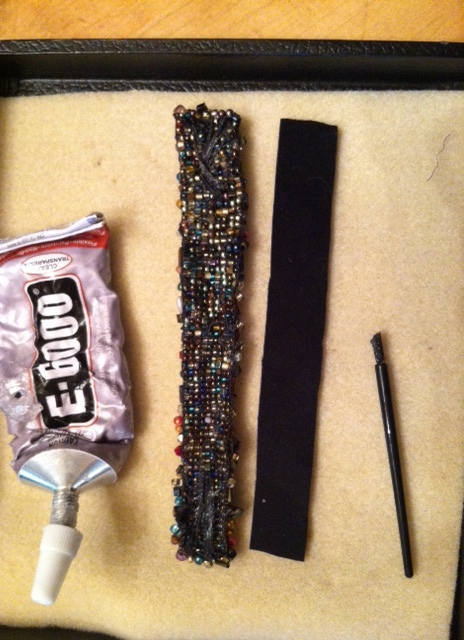 After that I warped my loom for a thicker wrap bracelet, but it was one of those projects that just sat on my loom. Yesterday I finally decided to re-warp and try a more traditional wrap bracelet. It was so fast and easy to do this on a Mirrix Loom! 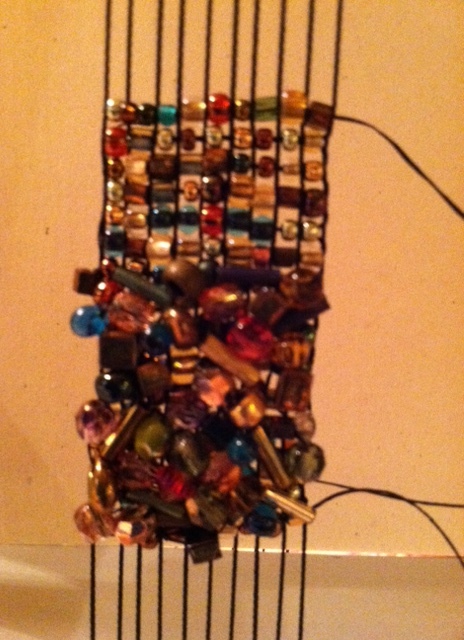 I chose some pretty 8/0 beads and crystals and tied off with a pretty glass button and that was it! And, hey, when you can buy an even simpler wrap bracelet for $200… this is a pretty good deal! If my name looks familiar to many of you Mirrix aficionados out there, it should. It is hard to believe but it was exactly a full year ago that I began blogging for Mirrix. 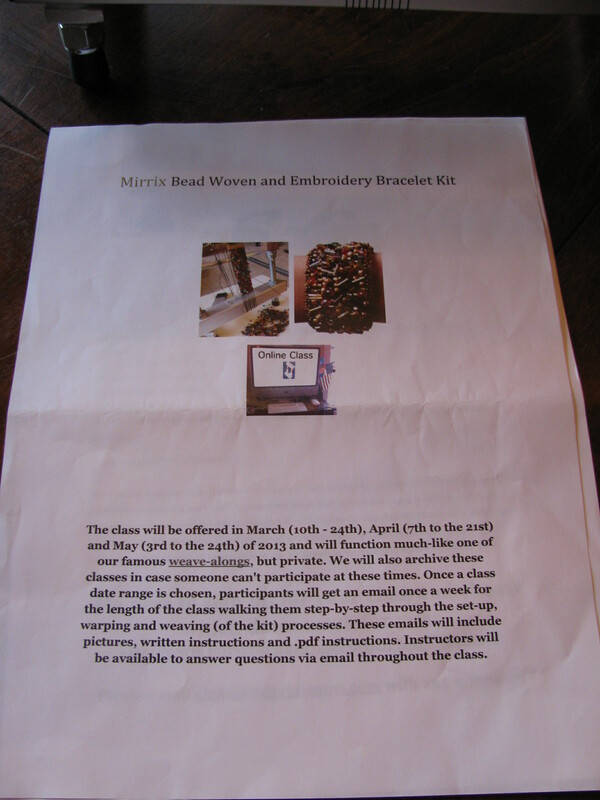 In fact, it was the end of July 2012 that I learned that I had won the contest that Mirrix sponsored to find a new blogger for Claudia’s Craftsy class. Well, I can surely tell you that a lot has happened during the course of the last year and unfortunately for me, much of it has taken me away from weaving and my Mirrix loom. However on a rare occasion that I was able to catch up with the Mirrix happenings, I caught sight of a really compelling bracelet that Claudia had designed. It didn’t have a name nor any real details other than that a special weave-along class and kit* was to follow. I went on about my business storing this information away for a later date when life returned to normal. Months later, while life hadn’t exactly returned to normal, I still had not forgotten about this mesmerizing bracelet. I had never seen anything like it before and although I had some idea as to how it might be constructed, I wasn’t sure I could copy it myself without some guidance. My spontaneous suggestion to Elena to commence blogging again was met enthusiastically, and here I am. If you too have been smitten with this mystery bracelet, then follow along with me as I take you through its construction, step-by-step. I will provide instruction in three parts. The first will detail bead weaving the bracelet’s base; the second will include the fun part- or the embellishment; and the third part describes the finishing touches in turning your beaded piece of art into an actual bracelet to be worn on your wrist. 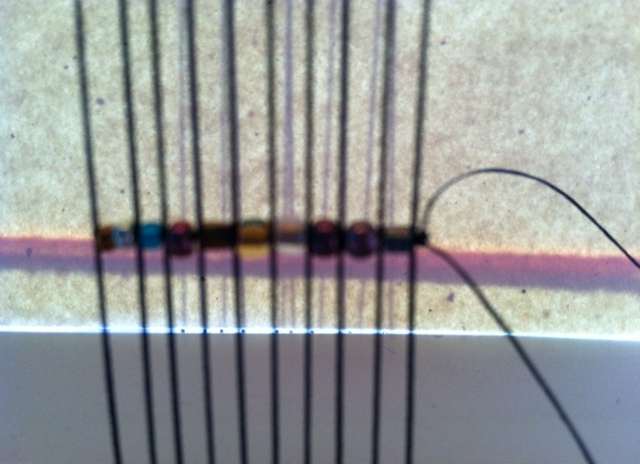 The warping is standard using ten warps of the C-Lon beading cord. No shedding device is necessary. 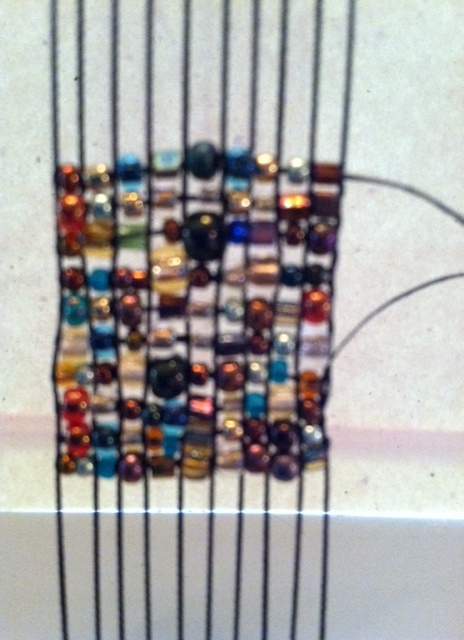 The weaving of this bracelet has two distinct phases. The first phase is quite basic where you will create a grid-like base using your choice between the 8/0 seed beads, 10/0 delica beads and an occasional 6/0 bead which are all included in the bead soup that comes with the kit. 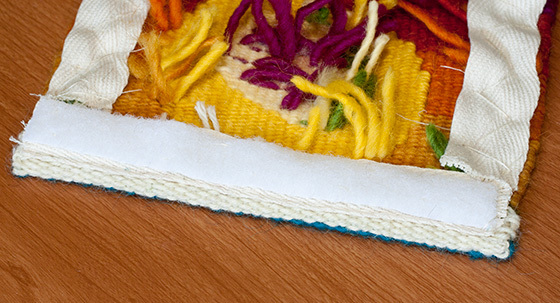 Welcome to the very last post in my CraftArtEdu Introduction to Tapestry series! Today I’m finishing the tapestry, which involves setting it up to hang on the wall. First, I trimmed all of the wefts down to about 1 inch on the back of the tapestry. Then it was time to twirl and tie off the bottom warps. I’m not great at twirling (twisting) yarn, so I kept my twists relatively short. I also waited to make the overhand knots until I had all the twists finished, so I could go back and redo any that were too loose. At the top of the sampler, you need to tie overhand knots directly against the header. 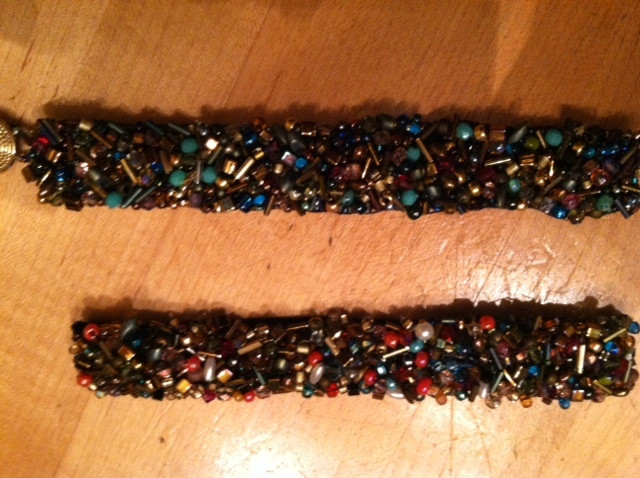 I used my beading awl to slide the knots down, but you can use a metal tapestry needle instead. The following photos were taken after I’d completed the finishing process (which I did away from my camera, watching the Tour de France). First, I folded over the top header and stitched it down. 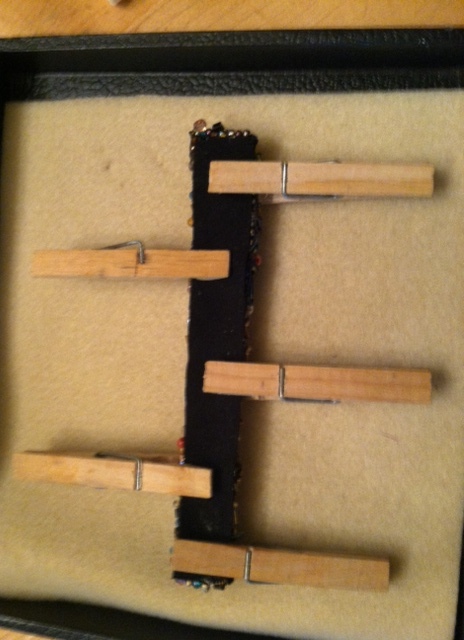 I then stitched on a piece of twill tape and a strip of velcro (these are included in the class kit). Then I stitched twill tape to both side edges of the back of the tapestry. I did all of this stitching by hand, sewing up around warps. However, because my sewing thread does show through here and there, I may try stitching through the backs of the wefts instead on my next project. I used a large zig-zag stitch, because you really don’t need many actual stitches to get this done. 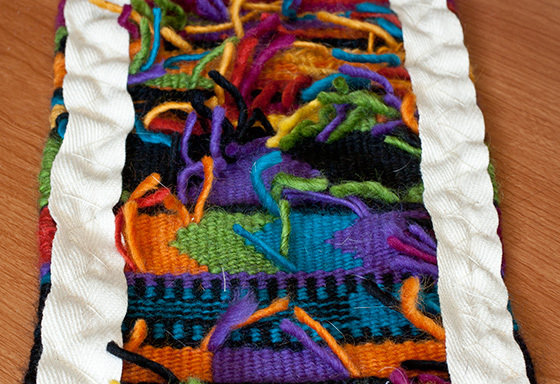 You just want to keep the little tails of weft yarn from showing along the sides of the tapestry. At this point, the only thing left to do is attach the matching piece of velcro to a piece of wood (not included in the kit) and hang it up on the wall. Here it is temporarily on my door, where you can see it better. You may notice that I need more practice to get my side selvedges straight. (Oddly, my problem seems to be leaving the edges too loose, rather than making them too tight). It’s so exciting to be finished! Although I made a few mistakes along the way, I still ended up with a pretty tapestry and, more importantly, a lot more confidence in my weaving. A big thank you to Elena and Claudia for this opportunity to take the class and even hop into their blog to blog about it. If you’d like try the sampler for yourself, you can hop over to CraftArtEdu anytime and sign up for the class. To see what I’m up to next, visit my blog or my profile on Weavolution or Ravelry. I also have a Tapestry board on Pinterest.